At long freaking last, I have opened the doors to the HappyDashery Vintage Shop. Can you tell I’m mildly stuck on this name-everything-after-Dashiell thing? It’s so much easier than actually having to come up with unique names. And it’s working, so I’m going with it. Opening a shop is something I’ve wanted to do for a long time. And while I still want an actual bricks and mortar shop, this is a fun and much easier way to achieve it for now. Eight month olds and retail shops do not mix. Anyway, I’m excited and scared and having a lot of fun. I even sold something! There’s some fine tuning to do over there and new items are being added every day (it’s a slow process over there at etsy). It’s my goal to start with vintage and then work into a line of vintage supplies and amazing things made with such supplies. Things made in my imaginary studio of glory. I’ve been dreaming lately about my imaginary studio and all the trimmings and I’m so happy to share that it’s nearly a reality. It’s a shared room (I can’t kick Neil out completely), but one whole half of it will have room for me. I’m all giddy just thinking about it! Once the walls are painted from drab gray and cranberry to an inspirational orange, I will be unstoppable. So, in summary, if you like the vintage, retro, mid-century, eames era, kitsch, insert your own label here stuff, check in with my store regularly. Also, if you want to help pay my mortgage, check in with my store regularly. I’ll see you there. Didn’t I just promise to be better? I did, didn’t I? Arrgh, I’m trying. Who knew pirates love the fair? You all have seen that episode of Wife Swap, right? I can’t believe I just uttered that phrase, but anyway. The episode with the modern day pirate family? Well, it’s one thing on TV, but another thing to see them just a few feet in front of me in a classic, “Land Ahoy!” pose. Brilliant. Sometimes I think Dash might be part piglet. And then he’s out like a light. We might be heading up to the Common Ground Fair this weekend. I’ll let you know if any actual pigs take a shine to Dash. That might tell us something. Ok, this site is in need of a serious makeover. More white space! It’s so bad that every time I come here to write, I get discouraged and go read other blogs instead. This is not good for me nor for my wallet. Makeover coming soon! Soon I tell you! In other news, I just spent a lovely afternoon thrifting with Robyn. This early fall day is sunny and lovely (do I talk about the weather a lot or is it just me? ), and just right for walking around town looking for just the right thing. There are some great thrift stores in Portland, though at least one has started researching their wares on eBay, which makes for some surprising pricing. I often wonder if they get the full price they’re asking. 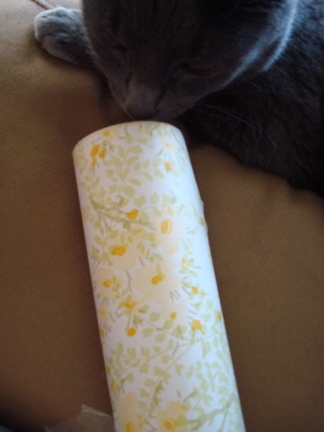 I found some great vintage wallpaper with delicate yellow flowers on it, which Violet needed to investigate immediately. 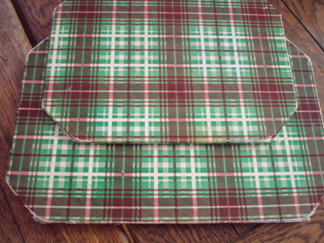 I also found a matching trivet set from the same era with a pretty ugly/cool plaid on it. Or maybe it just looks ugly against the backdrop of my dining room table. And is it maybe just a little annoying when you find yourself thinking, “Maybe I’ll just pay the money and consider it an investment”? Grrr… again. You are currently browsing the HappyDash weblog archives for September, 2007. All material ©2007 by Tonya Sattin. All rights reserved.